With over six million copies sold, countless children have been introduced to Chester Raccoon through The Kissing Hand, the first title in the series that firmly shows the importance of characters with whom kids can share their troubles. School is starting in the forest, but Chester Raccoon does not want to go. To help ease Chester's fears, Mrs. Raccoon shares a family secret called the Kissing Hand to give him the reassurance of her love any time his world feels a little scary. 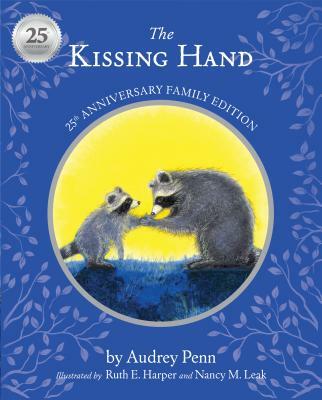 Now in its 25th year of printing, The Kissing Hand has found its way into the hearts of teachers, librarians, parents, and children around the world, especially during times of separation like starting school, entering daycare, or going to camp. Celebrate the special Kissing Hand anniversary with Chester and his mother in this limited edition family keepsake with a dedication page, Letters to Chester booklet download and, of course, heart stickers. Audrey Penn started her career as a ballerina dancing with the National Ballet, New York City Ballet, Stuttgart Ballet, and the Danny Diamond Dance Theatre. In 1980, she became too ill with Juvenile Rheumatoid Arthritis (JRA) to continue dancing but, because she had participated in children's theatre, children's dance, and always enjoyed children's literature, she turned to writing children's books for her creative outlet. Her passion for advocacy for children continually molds her writing style and subject matter. She has created her writing program - The Writing Penn - into schools, libraries, and children's hospitals, where she shapes and refines her story ideas in partnership with kids. Today, Audrey has written over 13 books and is a New York Times bestselling author of The Kissing Hand.